Millions of people are living with a "silent killer" as high blood pressure remains undiagnosed, a charity is warning. Some 5.5 million people in Britain are living with the condition, which the British Heart Foundation says is "simply unacceptable". The organisation is calling for "urgent improvement" in the number of people diagnosed with high blood pressure and is urging people to get checked out. Catherine Kelly, director of prevention, survival and support at the British Heart Foundation, said: "5.5 million people in England are living with undiagnosed high blood pressure, which puts them at a much higher risk of suffering a potentially deadly heart attack or stroke. "For a condition which is so easily detected and managed, this figure is simply unacceptable and we need an urgent improvement in the number of people diagnosed with this silent killer." Anyone suffering from high blood pressure or associated conditions can take out medical travel insurance to provide cover when travelling abroad. High blood pressure or hypertension can increase a person's risk of heart attack, stroke and vascular dementia. A quarter of British adults suffer from the condition and, as its symptoms are mostly unnoticeable, many people are unknowing sufferers. Public Health England (PHE) is encouraging people to get checked and to "know their number". Professor Kevin Fenton, PHE's director of health and wellbeing, said: "It is a serious problem when a disease that is largely preventable, like high blood pressure, is one of the leading causes of premature death and ill health in the country. "We all memorise important numbers in our lives, whether it's our PIN and telephone numbers or the latest football scores. Knowing your blood pressure number is an easy step to take that has the potential to save your life." A "mid-life MOT" is offered free to people aged 40 to 74. Of those eligible, fewer than half (46%) have actually taken up the offer of an NHS health check since its inception in 2013. The PHE says high blood pressure and affiliated diseases cost the NHS more than £2.1 billion each year. 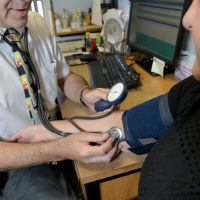 The executive agency is now urging adults over 40 to have their blood pressure tested, saying increasing the number of diagnosis by just 15% would generate £120 million in savings each year.